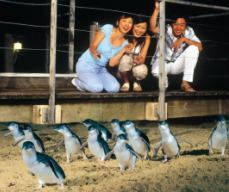 Join our Penguins Express evening tour and be taken directly to the Penguin Parade on Phillip Island. Watch the penguins' arrival on Summerland Beach with premium viewing that is guaranteed high traffic of penguins waddling right past you. Walk with them from elevated boardwalks and see if their burrow is nearby! At the Visitor's Information Centre, walk through the "Penguin Experience" exhibit and learn more about the life of these little flightless birds. Dinner is available (own expense) from the Penguin Parade Restaurant. 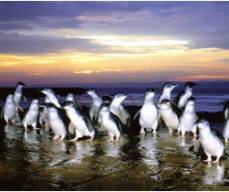 Explore the Visitors Information Centre to learn more about the life of the Little Penguin as you walk through the "Penguin Experience"